This work is one of the last portraits Degas created, and presents a private moment in Madame and Monsieur Louis Rouart’s relationship. 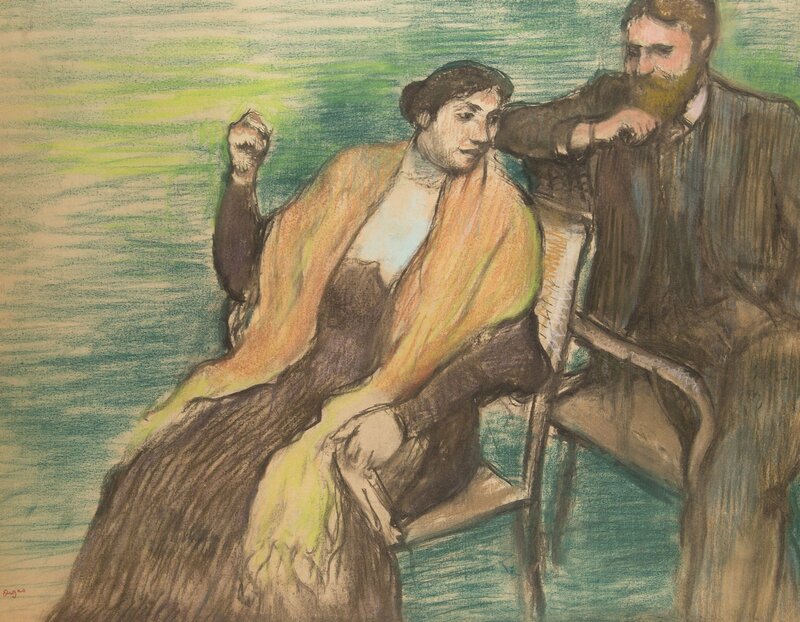 Degas’ closeness to the couple is evident in their comfort in him depicting such an informal moment. Central to the composition is Christine, an indication of her open and outgoing nature which complements her more reserved husband. Turning her head wistfully to engage with her husband, it is Louis who positions his body towards her, a sign of his devotion and the intimate moment they are sharing. One is given a tangible understanding of the couple through the smile that plays upon Christine’s lips and the more withdrawn expression of her husband. This is a new portrait style for a married couple, revealing an insight into a very real relationship, instead of a formulaic structured portrait sitting. Degas was born in Paris, France, the eldest of five children of Célestine Musson De Gas and Augustin De Gas, a banker. The family was moderately wealthy. At age eleven, Degas (as a young man he abandoned the more pretentious spelling of the family name) began his schooling with enrollment in the Lycée Louis-le-Grand, graduating in 1853 with a baccalauréat in literature. Degas began to paint seriously early in his life. By eighteen he had turned a room in his home into an artist’s studio, and had begun making copies in the Louvre, but his father expected him to go to law school. Degas duly registered at the Faculty of Law of the University of Paris in November 1853, but made little effort at his studies there. In 1855, Degas met Jean Auguste Dominique Ingres, whom he revered, and was advised by him to “draw lines, young man, many lines.” In April of that same year, Degas received admission to the Ecole des Beaux-Arts, where he studied drawing with Louis Lamothe, under whose guidance he flourished, following the style of Ingres. In July 1856, Degas traveled to Italy, where he would remain for the next three years. There he drew and painted copies after Michelangelo, Raphael, Titian, and other artists of the Renaissance, often selecting from an altarpiece an individual head which he treated as a portrait. It was during this period that Degas studied and became accomplished in the techniques of high, academic, and classical art.